A great new feature that we have recently added to our online invoicing tool Paper Free Billing is the ability for the recipient of your invoice to review, and easily see all open invoices that they have received from you, in a web browser, as well as being able to view the Invoice in a web browser for those clients who do not have a HTML email compatible client. 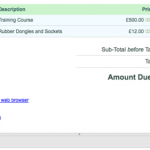 At the bottom of the invoice, there will now be two links accessible to your clients. Clicking on any of the items in this list will take them to the Open Invoice which requires their attention. Hi Steve, found this post via the #4N Forum. Paper free billing it’s the way the world’s going. Good stuff. 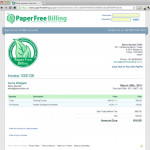 Next post: Online Invoices – How to send your First Invoice.